The Christmas answers is always one of my most popular posts – and I think this year will be even more so as I obviously made it a little tricky. Especially number three, which even had it’s own #noideaonquestion3! Congratulations to Craig at Macmillan, who was the only person to get all 15 right. Eagle eyed readers will note that he was first out of the hat last year, so double congratulations! As ever, he wins £50 for the charity of his choice. And thanks everyone who entered. £200 is also going to SOFII. So, to put you out of your misery, the answers…. 1. All bands to have had 3 Christmas number ones. Band Aid was a slight stretch as they had different make-up, but that didn’t seem to throw you. 3. The tricky one – only Craig got this. They are all Christmas songs where the title doesn’t appear in the lyrics. I bet a few of you have bruises from kicking yourselves about that one. 4. Bob the Builder. Sorry to remind you about this song. The sequence was Christmas number ones from 1997 to 2000. I wonder if we’ll have a sequence that ends with LadBaby one day? 5. Drummers drumming. From the 12 days of Christmas. 6. Fuel. The last word of each line from the first verse of Good King Wenceslas. 9. Do They Know It’s Christmas? I hope you this gave you a little bit of fun over the Christmas period. All that remains is to wish you a very happy Christmas, and a healthy and happy 2019. Christmas is nearly with us. 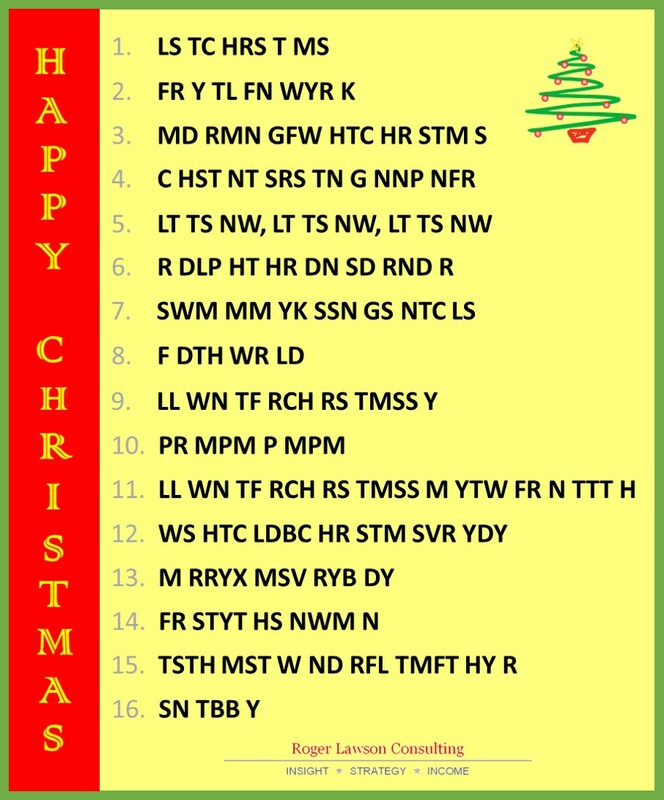 So it’s time to wish you a very happy Christmas, and send you my quiz. I got so many replies last year from people who share my love of Only Connect, that I decided to stick with it again. But this year I have questions for all rounds except a Wall – maybe next year for that one. 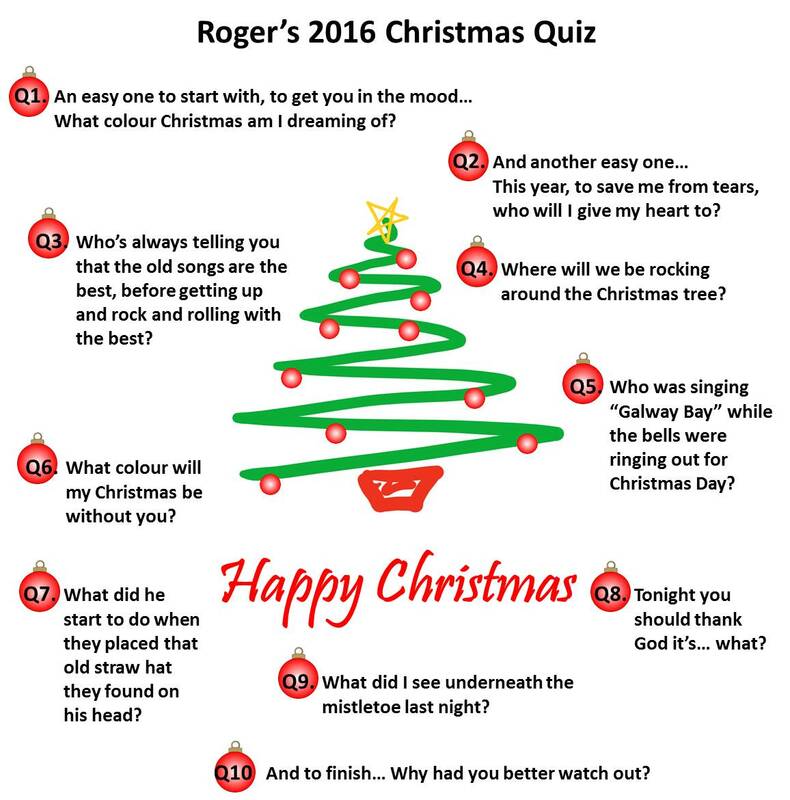 I think some of these are a bit tricky, so please send in as many answers as you can get, to me at Christmas@RogerLawsonConsulting.com. As always, every entry (no matter how many questions you get) will see £2 being donated to the wonderful SOFII. Please help me get to the target of £200 again. And at midday (GMT) on Christmas Eve, one person will be selected at random from those that get most right to win £50 for the charity of their choice. I hope this brings you a little bit of fun at this busy time of year. And I hope you have a fantastic Christmas and a happy and healthy 2019. Judging from the replies I received, there are lots of other Only Connect fans out there. Maybe next year I’ll create a wall? Congratulations to so many of you who got all the answers correct – more I think than for any previous quiz. Once again, £200 is on its way to SOFII. And a big congratulations to Craig from Macmillan Cancer Support who was the first drawn at random and wins £50 to donate to whichever charity he chooses. And thank you too to those who made me laugh. I particularly liked one person who thought they were all acronyms that their programs team use. Let it Snow, Let it Snow, Let it Snow which I had to put in as it reminds me of my holiday this year. We were in Mexico in August and this was played in a restaurant where we were eating – surreal! Rudolph the Red Nosed Reindeer. Of course! Feed the World, the refrain from Band Aid’s Do They Know It’s Christmas? All I Want For Christmas is You. Cheesy…? Yes. Brilliant…? Yes! Pa Rum Pum Pum Pum, from The Little Drummer Boy. Did you know that this was first recorded by the Trapp Family Singers who were the inspiration for The Sound of Music? All I Want For Christmas Is My Two Front Teeth. Sorry. Enough said! I really hope you enjoyed the quiz this year. I’m already thinking about next year’s! It’s that time of year again. Christmas is just a few weeks away so it’s time for a good quiz. This year’s quiz is my way of paying my respect to my favourite TV quiz – Only Connect. For those of you who don’t know it, the last round is the ‘Missing Vowels Round’ where the vowels are taken out of well-known phrases and spaces are added in random places. Your task is to identify the phrase. Would be ‘Simply having a wonderful Christmastime’ by Paul McCartney. So over to you. Regular players of my quiz will recognise a few of my favourites in here, but there are a few new ones too. When you’ve got as many as you can, please email me your list. For every entry I receive I will donate £2 to the wonderful SOFII. And, at midday on Tuesday December 19th, one of the people who get the most right will be selected at random and given £50 to donate to a charity that they choose. P.S. If you want to know the answers I will post them before Christmas – be sure to sign up to make sure you get them. I had more entries than ever this year. Quite a few got the answers all right, but a few struggled so I’ll put you out of your misery. White is the colour of Christmas that I’m dreaming of, as sung by Bing Crosby (and quite a few others since!). I told you it was an easy start. Someone special is who I’ll give my heart to this year, unlike Last Christmas as Wham! sang about. Your Granny is up and rock and rolling with the rest, according to Slade in Merry Christmas Everybody! It’s CHRIIIIIIIIIIISTMAS! The Christmas party hop is where we’ll be rocking around the Christmas tree thanks to Brenda Lee. The boys of the NYPD choir were singing ‘Galway Bay’ as we heard in the brilliant Fairytale of New York by The Pogues and the much missed Kirsty Macholl. Blue is the colour that my Christmas will be without you – or more accurately it’s the colour Elvis’ Christmas would have been without you. He began to dance around. This one caught out a lot of people, who obviously aren’t fans of Frosty the Snowman. Thank God it’s them instead of you, which Bono sang on the original BandAid. I saw Mommy kissing Santa Clause underneath the mistletoe last night. Santa Clause is coming to town, which is why you’d better watch out (and better not cry etc). I hope this gave you a little bit of fun, and well done to those of you who got them all right. Thank you to everyone who entered. There is a donation of £200 on its way to SOFII as you read this. And especially well done to Kat from the University of Southampton, who was the first with 10/10 out of the hat who will get £50 to donate to any charity she chooses. All that’s left is to wish you all a very happy Christmas and new year and a successful and healthy 2017. It’s nearly here, so I want to wish you a very Happy Christmas. 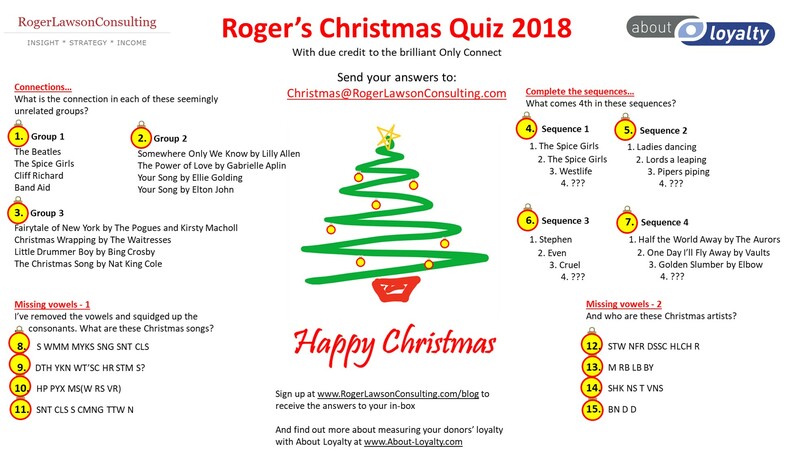 My Christmas Quiz is back. And it’s testing how well you know your Christmas lyrics. How many of the ten questions on the card can you answer? Just send me your answers. For every entry I receive (right or wrong) I will give £2 to SOFII*, and at 5pm on Thursday 22nd December I will draw one name from all those who get the most right answers and donate £50 to a charity of their choice. Just email me (or use the Contact Me link) with your guesses. Enjoy the quiz. And I wish you and your loved ones a very happy and peaceful Christmas and New Year.